MATERIALS RESEARCH FURNACES, INC., was founded in 1990 by a group of people from the vacuum furnace industry and consists today of 30 highly trained and experienced engineers and technical people. MRF Inc. was established to answer the challenge of the Research & Development community to produce the finest, high temperature, high vacuum and controlled atmosphere furnaces in the industry. MRF Inc. has supplied new furnace systems and replacement parts to numerous universities, national laboratories and to private industries. The furnaces can be used for an array of applications and are specifically geared towards flexibility and diversity. 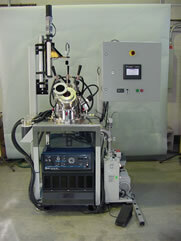 Most are capable of running in and switching to different atmospheres: high-vacuum, reducing, oxydizing, inert. All furnaces have band or mesh heaters for optimum temperature uniformity. 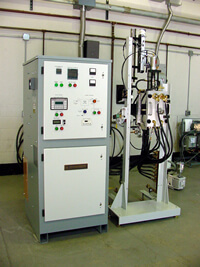 Their versatility makes these furnaces an ideal tool for universities and R&D departments. Many kits can be added to increase the functionality of a furnace as well: Quick Quench kit, heat exchanger for quick cooling, Physical test kit, Gas purifier, Pressure control, etc. Please contact us with your specific furnace needs.